All of us get friend-zoned at one point or another. And while that, unfortunately, doesn’t make it any less embarrassing, you can rest easy knowing the last moment you got sidelined wasn’t caught on the kiss cam and watched by thousands of people. Ouch. Poor dude. It started off normal enough. 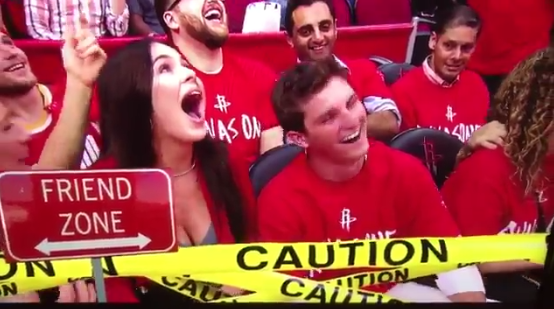 Some girl and some guy were minding their own business watching a Houston Rockets game. The notorious kiss cam starts. The camera lands on them. She’s like, “Omg.” Normal response. Nothing to see here. He’s like, “Woooah,” also. He, then, looks down between his legs for a second. Little weird but okay. Although in retrospect, it’s almost as if he was trying to buy more time to have this inner monologue: “Should I go for it? Do I have a choice? Why is this happening right now? I. Don’t. Know. What. To. Do.” It’s not going to be good, my friend. 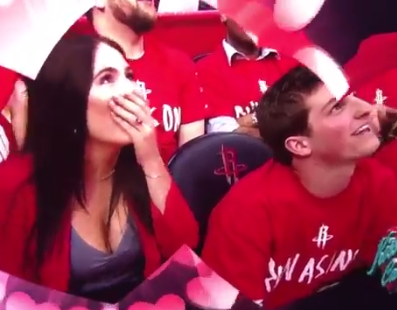 We should note that these two have not made eye contact since learning they were on the kiss cam. Meanwhile, she’s mouthing, “No,” and shaking her head at the camera. So awkward. 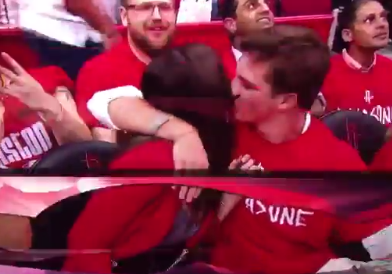 The kiss cam is super awkward ALL around, though. WHY? Then, he pulls his head up and decides to go for it. He puts his arm around her and leans it, but is swiftly given THE CHEEK. 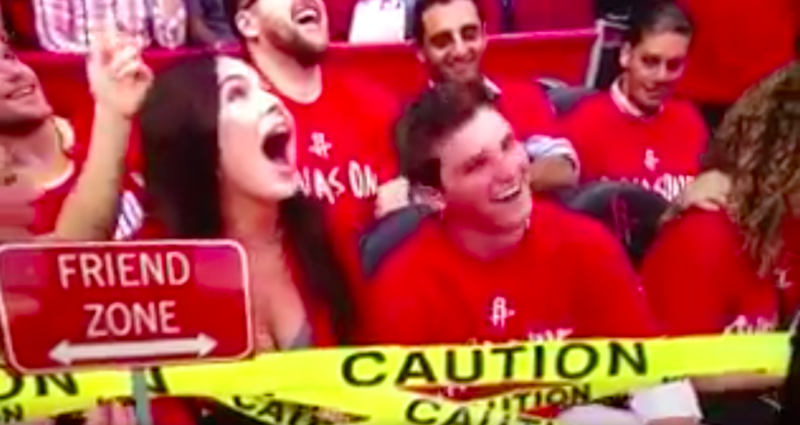 The kiss cam editing crew then adds a fake road sign which says, “Friend-zone,” with yellow caution tape. Dang. Dude is straight up humiliated. His face is red. He’s laughing like this is funny for him too when he knows it’s not. She looks up at the camera and sees the “friend zone,” sign. Her face to us here says, “Omigod. I feel a little bad for him, but the sign is not wrong.” Welp. That’s that. Should the kiss cam even be a thing? Some places, such as Syracuse University, have even considered doing away with their kiss cams because it makes people so uncomfortable. But, then again, you can always be like this guy and make out with your drink instead. We hope your heart recovers soon, kiss cam man.